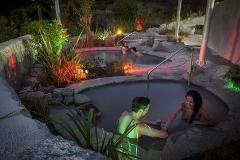 Hells Gate Geothermal Park & Mud Spa is New Zealand’s Historic Spa experience. 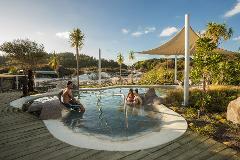 This geothermal area with unique thermal muds and acidic sulphurous waters has been used by the local Maori (Ngati Rangiteaorere) for bathing , relaxation, healing and overall wellbeing for more than 800 years. The natural geothermal mud can be liberally smoothed over the skin while relaxing in the warm sulphurous waters for 20 minutes. The mud bath is followed by a cool shower which helps restore blood circulation before relaxing in the hot sulphur mineral spas. The warm geothermal mud opens and cleans the skin’s pores, while the sulphur spa’s give your skin a gentle exfoliation and deep cleansing, leaving your skin clean, soft and smooth to touch. 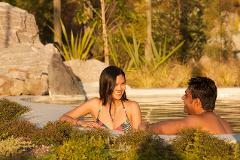 Escape into another world of geothermal wonder, overlooking New Zealand’s spectacular geothermal scenery from the freeform sulphur pools in our landscaped bathing area surrounded by native trees and plants. Cool off under the mineral enriched waterfall cascading into the cool plunge pool to refresh during your spa experience.